Using Elastic Content in your email campaigns is so easy that it actually reduces the time required for each campaign. Here are a few of the built-in tools to help improve your email results. You can do that now. Billions of email clients will fetch new content each time a message is opened. All that’s been missing is a system to deliver that content dynamically. Content changes can be pre-scheduled with a simple spreadsheet list. Team, Pro and Enterprise tiers provide our patent-pending individualized recipient updates. Each recipient is shown a content sequence based on rules you set, based on when they open messages. Full control over content look, feel & layout. Transcend email HTML, boring fonts and stiff table-based design with rich, compelling 1/1-personalized templates. Multiple text-blocks, with unlimited merge fields for personalized data - each formatted independently. Put images over images on the fly. 100’s of fonts, complete color/transparency and formatting control. Search and choose from over 2 million royalty-free HD background photos or use your own. Mobile-optimized images adjust automatically - no more blurry images. Do you send HTML email now? Then you can use Elastic Content in your campaigns. You don’t need to change email platforms or marketing systems. You don’t need to call IT and schedule an integration project. If you can click Paste, you can use Elastic Content. Email Service Providers. Elastic Content combines merge-field personal data with marketer scheduled data. Result: 1/1 personalized, dynamically-updatable visual content. Use native merge fields for: IBM Watson, MailChimp, SendGrid, Active Campaign, Dotmailer, Campaign Monitor, Emma, Responsys/Oracle, iContact, Infusionsoft and dozens more. CRM Systems - every email you send out can include personalized content. Just add one line to your CRM templates to generate eye-catching visual content for each recipient. Salesforce? Check. AgileCRM? Yes. Microsoft Dynamics? Yes. Need something specific? Get in touch. Marketing Automation - make your content their content with on-the-fly visual personalization. In the box already: Hubspot, Marketo, Ontraport, Pardot, SharpSpring. Got something else? Call us. Image-tag content isn’t sent with email messages; email clients fetch it from a server. Campaign-Genius is a specialized image cloud that creates visual content on-demand, and tells email clients how long to keep it. 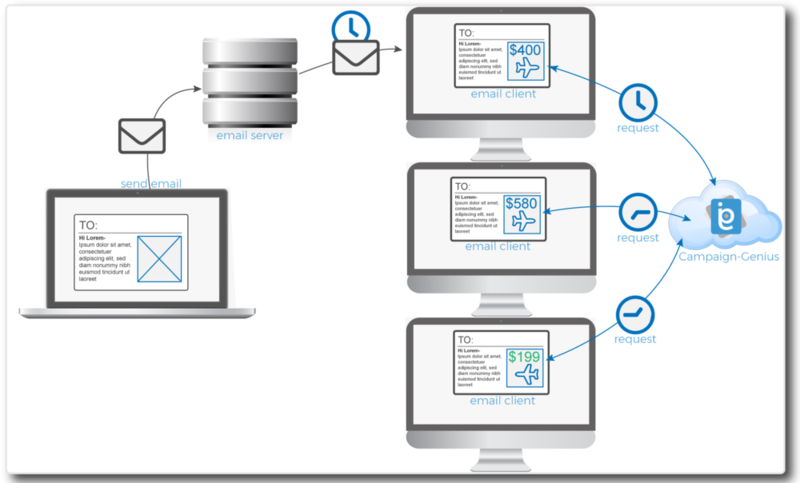 Email/marketing systems merge recipient data into the tag for each outbound message. Each email client sends that data with the image request. Campaign-Genius combines it with marketer-defined parameters such as scheduled values, and returns a unique image to each client.